1. Loss of sight; literally, "not seeing": A trained seeing eye dog is useful if a person suffers from ablepsia. 2. Blindness, unable to see: Because Dan's mother experienced ablepsia, she is using a white cane to help her get around safely in the community. The congenital absence of arms or having no arms: Abrachia is an abnormal physical condition resulting from defective genes or developmental deficiencies. A congenital absence of the head and arms or upper limbs: The veterinarian was puzzled by the birth of the pig that had been born with abrachiocephalia. The acephalobrachia and the abrachiocephalia consist of humans that are missing heads and upper arms during fetal development and then at birth. Without gills; no gills: An example of an abranchiate mammal is a whale. 1. Without a bottom; bottomless (no bottom): The deep canyon seemed to be an abysm because Jodi could not see the bottom. 2. Anything too deep for measurement: The well in the garden was an abysm because Daryl was unable to determine how deep it was. 3. An immeasurably profound depth or void; a bottomless pit: Verna's heart felt like an abysm of sadness after her boyfriend left her for another relationship. 1. Immeasurably deep, severe, or extreme; fathomless: The depth of her sorrow was an abysmal situation and, as a result, she could find no expression except to cry. 2. Incapable of being measured or even understood; incomprehensible, inscrutable: Kristy felt like an abysmal failure because she couldn't remember how to spell the key word in the spelling contest. 3. 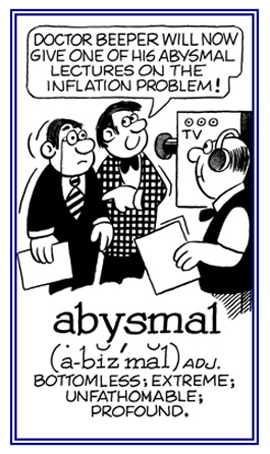 Etymology: from the year 1656, formed in English from obsolete abysm, "bottomless gulf, greatest depths"; from Old French abisme, from Vulgar Latin abyssimus. © ALL rights are reserved. In a terrible manner; very bad: Kirk's lack of manners abysmally reflected his upbringing and attendance at a lower level public school. A large mass of intrusive igneous rock having an exposed surface area of more than forty square miles, with no apparent base or floor of older rock: In their oil research, the scientists described the abyssolith layers of rock in which the fossil fuel could be found. The term abyssolith is part of the vocabulary used in the science of petrology. Showing page 2 out of 23 pages of 340 main-word entries or main-word-entry groups.